When I was in Adelaide for the Women’s Tour Down Under, I was lucky enough to catch-up one-on-one with Australian female pro cyclist Chloe Hosking. I’ve written about Chloe before and have followed her career with interest, so it was really great to sit down with her for a chat after Stage 2 of the Women’s Tour Down Under. Chloe had a great start last year – the best in her career, but after winning Stage 4 of the Women’s TDU, the Cadel Evans road race and then the coveted Gold Medal at the Commonwealth Games. After those three great victories, Chloe who’s fairly harsh critic of her own performance she says her year went rather badly. “I really let myself down after April last year. I had crashes, team dynamic issues and I wasn’t as strict with myself as I feel I should have been. “So this year I’m starting a bit slower. I’m still training just as much but the intensity is less. This year I’ve got other goals with several of the Spring Classics like De Panne in my sights,” said Chloe. Reflecting on her Commonwealth Games triumph of last year, she says that having a clear leader and a team plan led to her ultimate success. ‘’It’s a pity that each team member who worked so hard didn’t also get a medal but that’s how our sport works, and that’s what we all sign up knowing,” she added. Crucial to Chloe’s success is the team of support people she has built around her including her coach, nutritionist, psychologists, and of course her soon-to-be husband, and her mum. Chloe’s mum Sheryn acts as her PA and keeps her life on track. Chloe’s shares her time between her European base in Girona, Spain and her home in Canberra where she spends many hours training alone with her very specific program. “When you ride a super specific training schedule and need to keep within power zones it’s very hard to train with others. My partner sometimes joins me, and is happy to ride at my pace, but I rarely ride with others. “My partner and I met in rehab. He’s a hockey player and had injured his knee. Things happen in rehab that wouldn’t otherwise occur when you’re training intensively,” said Chloe. Chloe is keen to talk about more and more women earning a proper living as professional road cyclists. “It is a reflection of the professionalism of women’s pro cycling and shows that we’re on an upward trend. More and more riders are earning a sustainable salary – we’re not all poor and struggling. And we need more exposure if we’re going to justify bigger salaries,” she added. 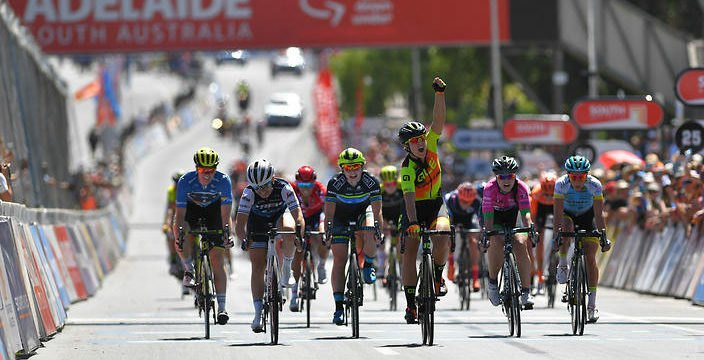 A few days after the interview I was thrilled to see Chloe win stage 4 of the Women’s Tour Down Under and here’s what she had to say post race. I also asked her how she was enjoying the Women’s TDU and she said “it’s phenomenal to see the event growing. Adding the extra road stage last year and offering equal price money really stepped it up. It’s really well organised and I hope it continues to grow,” concluded Chloe. 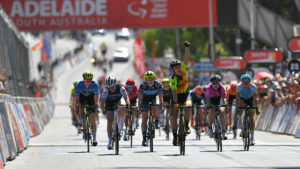 Did you enjoy reading about Chloe Hosking? Who else would you like to hear from? Share your ideas via comments or the Women Who Cycle Facebook page.